10) Does Greg Pirkl shop at The Men's Wearhouse? I guarantee it. 9) In handwriting: "Thanks, Mom. I love my senior portrait!" 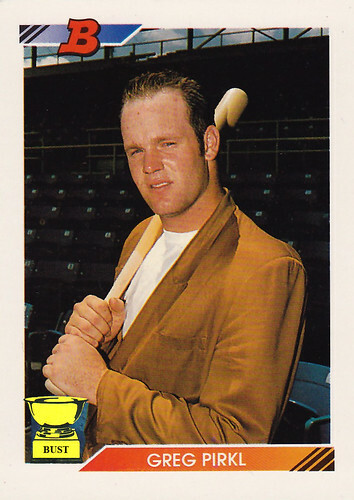 8) Greg Pirkl, above, sports the latest fashion trend, a sport coat from your father's closet. 7) Hi, I'm Greg Pirkl. I like baseball and snuggling, and I'm looking for that special someone. 6) Pirkl: In need of a vowel or two since 1992. 5) What team do I play for? Doesn't matter. Let's talk positions, sweetheart. 4) From community newspaper: Greg Pirkl has been named Freedom Ford's salesman of the year. "I want to thank my girlfriend, my homies and the Lord almighty above," he said. "And, of course, this honor wouldn't have been possible without my two-home run game in the homecoming game senior year. Go Eagles! Wooo!" 3) More zits than RBIs, two years running. 1) Never cool. Not even in '92.